Climate change has been a hot topic for over a decade. Researchers have continued to alert the public about the long-term dangers of rising sea temperatures, an increase in extreme weather events, and even the climate’s impact on the economy. Despite their warnings, there is still sizable opposition to the dangers of climate change. While the opposition’s opinion is rarely swayed by ecological impacts, like disappearing coral reefs, the economic impacts of climate change may change some of their minds. Regions prone to extreme weather events will experience a larger negative impact from climate change over time. Countries with stronger economies will see better results than countries with weaker economies. “It is very easy to get lost in the sea of data with climate change,” Jerry shared. So he focused his research on climate change economics. “The main challenge for cleaning the data was merging different datasets together. Since the majority of the data I used came from scientific papers, just reading the methods that the authors took helped clear any confusion,” he explained. He used tidyverse to clean the data. 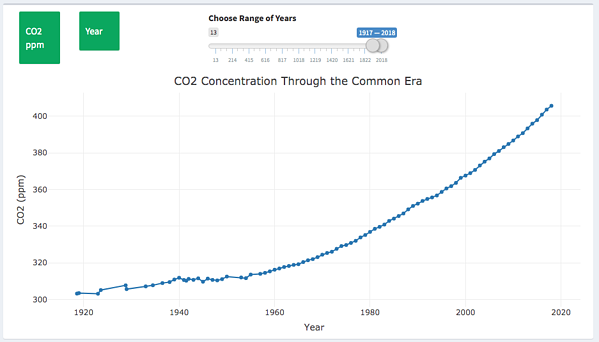 Explore the Climate Change data in his Shiny app. Jerry created his visualizations with Plotly. To show trends and projections for climate change over time, he used scatterplots. He used choropleth maps to show how climate change has affected each country over time. Jerry discovered how drastic carbon dioxide has increased during the past 100 years and how it has affected grain production. He also found that developed countries are more prepared for climate change than developing countries.